What is a variable rate tariff? Also known as a standard variable rate tariff (SVRs), a variable rate tariff is the default price plan that an energy company offers. The rate on a variable tariff fluctuates with the constantly changing prices in the energy market. Variable rate tariffs follow the price that the energy company pays to obtain gas and electricity for their customers. These are called wholesale energy prices. Price adjustments due to wholesale price changes are typically very small, because wholesale prices are less than 50% of what the consumer pays - there are taxes, delivery costs and profits on top. On a variable rate deal, the price you pay is adjusted in accordance, which means you have little protection when energy prices rocket. Ofgem, the government regulator for gas and electricity markets in the UK, offer protection by ensuring that suppliers give 30 days notice that they are going to put their prices up. So you can switch tariffs, as long as you keep up to date. And when energy prices drop? Unfortunately energy suppliers are renowned to be pretty slow at passing any price benefits on to you, the customer. On a fixed rate energy tariff you pay a frozen amount per unit over a certain time period, no matter how much energy prices fluctuate. So this can really help to manage money. However, fixed rate does not mean that you will pay the same each month for your energy - it depends on how much energy you use. So monthly bills differ. Contracts are usually for a year, but many suppliers now offer short term contracts and much longer ones. In a fixed rate energy deals over a long period of time - say 2 years - you may find you are paying over the odds as energy prices drop. There is often an 'early exit fee' on a fixed rate deal which you pay if you decided to switch before the end of the contact. So be careful signing up to fixed rate energy deals. On the other hand fixed rate deals can be really competitive because energy suppliers want to encourage customers over to their tariffs. When your contract ends, if you do nothing, the energy supplier will put you onto a standard energy plan, as outlined above, which are often the most expensive on the market. This is where UK residents are really losing out. With an online energy plan usually everything is done online - the signup (through the suppliers website or through a third party), meter readings, bill payments and even customer service. Online energy deals can be cheaper because supplier resources are cut when you are managing your own account online. So which energy deal is best for you? If you are comfortable navigating the internet online energy deals are usually offered at the lowest cost and you can sign up for a fixed or a variable plan. Fixed price plans offer an amount of certainty and some great savings if you freeze cost for units at the right time. Contracts can be over a long period but as most energy suppliers gradually put prices up this would be a saving for you. However there can sometimes be big drops, which is when you would lose out. As energy companies charge ‘early exit fees’, it can be expensive to leave. A variable plan can be a gamble as you will pay more if your supplier puts up energy prices. But if you keep an eye on the market, and switch often huge savings can be made. Use a utility comparison site like Swichomatic to constantly check the energy market, and easily switch at the right time with no exit fees. This is the option that we can recommend to save yourself a lot of money. But you have to do this regularly! If you enter your email address on our comparison form we will email you every 6 months to remind you to make the switch. Save money on energy bills by using less energy - read our article ‘How to save money on energy bills’. 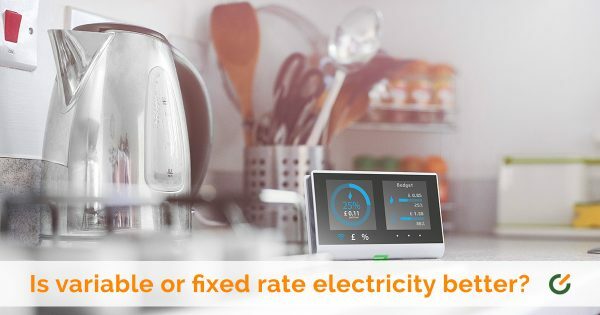 When is it good to be on a variable rate energy tariff? Variable rate electricity and gas plans are an especially good option if your in a short term let. Be aware that if energy prices go up, so does your bill. So keep an eye on energy prices and be ready to compare and switch tariffs. Your energy company should give you 30 days notice before they pass any price increase on to you, which means you have plenty of time to find and switch to a better deal.